There is an interesting dichotomy in the age-old adage, "One man's traitor is another man's hero." How can a man be considered a traitor to a country of which he is not a citizen? Jefferson Davis, President of the Confederate States of America, was not alone in this conundrum, but as the Head of State, he was the focal point of the accusations levied against secessionists by the victorious Northern government during, and in the aftermath of, the War Between the States. While slavery has always been touted as the cause of the war, there are strong arguments in favor of the right of any community to secede from a political union with which it no longer has any common interest. Albert Taylor Bledsoe, a University of Virginia mathematics professor, succinctly makes this case in his opening statement: "The final judgment of History in relation to the war of 1861 will, in no small degree, depend on its verdict with respect to the right of secession" (page 1). History is continually making that judgment. When the formerly "united" States of Yugoslavia began breaking apart in 1990, the United States was among the first in the international community to recognize the new States of Slovenia, Bosnia-Herzegovina, and Croatia. This is a contemporary example of what was lacking in 1861. That a nation's sovereignty does not depend upon anything more than the willingness of other nations to acknowledge the sovereignty of that State, and that self-determination is the right of any community seeking its own national status. The Yugoslavian constitution did not contain any legal mechanism that allowed a constituent State to dissolve and withdraw from the union, and many nations composed of individual States similarly face the same problem. It may be for this reason alone that children in Great Britain are taught that slavery was the cause of the "American Civil War": in case the Welsh, or the Scots are tempted to declare their sovereignty and look for recognition from nations unsympathetic to British power. The French could not tolerate such a move in Corsica or the Basque region – both of which have separatist movements. The Spanish could not endure any similar threat from the Basques or Catalans; Canada could not allow Quebec to make such an attempt. Modern history has shown that the right to secede does exist, not just in the Balkans, but in Norway in 1901 (when it separated from Sweden), in Czechoslovakia (when it was split in 1992) and in Rhodesia when a unilateral declaration of independence from Great Britain was issued in 1965 (and subsequently became Zimbabwe in 1980). 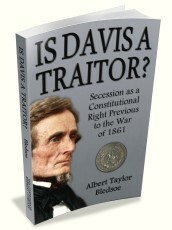 It follows, then, that Jefferson Davis could not have been a traitor to the United States, for he considered himself a citizen of Mississippi, a "free and independent State" within the Union that had no means of recognizing a right to secede and which resorted to military force to prevent free and independent States from withdrawing. Bledsoe's arguments may be laborious, but his treatise is necessary reading for any student of the history of the war. As many others have done, Bledsoe uses the history of the American States, from the moment they were recognized as "free and independent" bodies by the British at the Treaty of Paris in 1783, to the declarations of secession in 1861, to document the legal right of the Confederate States to withdraw from the Union. Simply because the Constitution did not – and still does not – recognize the right of any State to secede, does not mean that it is not the right of any State to declare its own sovereignty. This is recognized today in the Charter of the United Nations, Article 1:2 "To develop friendly relations among nations based on respect for the principle of equal rights and self-determination of peoples, and to take other appropriate measures to strengthen universal peace." Bledsoe's title is somewhat misleading, for this book has much more to do with the technical aspects of secession than the loyalty of Jefferson Davis. Those seeking insight into the life of Davis will be disappointed, but those seeking modern parallels will find a trove of reason and sound argument. Bledsoe blames the overwhelming power of the Northern media for propagating the notion that any son of the South who fought against the Union was a "traitor." The reader will also gain a greater appreciation for the imperfections of the American Constitution, flaws which may still be in need of repair as a State such as Arizona attempts to define its sovereignty by introducing legislation requiring people to carry papers and prove their citizenship when required to do so at any moment's notice. Does such a law make Arizona governor Jan Brewer a "traitor," assuming powers thought to be reserved for Washington? Or does it make her a hero to Arizonans who seek to "build a better Arizona" (as her website claims) and thereby a better United States of America? Unfortunately, a modern-day Jefferson Davis may find it harder to defend himself against the accusation of treason. Since 1892, young Americans have sworn an oath of allegiance to the central Government every day in school, by which it is implied they acknowledge the sovereignty of that Government over their State. To be sure, Americans have a long way to go in recovering those political principles that their forefathers believed to be "self-evident" and which the people of the South fought, albeit unsuccessfully, to maintain.